NETWORK FINALS: AMERICA’S GOT TALENT and the new WHOSE LINE IS IT ANYWAY gained 0.1 in final numbers, while coverage of the REPUBLICAN NATIONAL CONVENTION went down 0.2 at NBC and up 0.1 at CBS. CABLE HIGHLIGHTS: FOX News feasted on the REPUBLICAN NATIONAL CONVENTION, with 4 shows in the night’s Top 10, led by the 10PM hour at 1.06. CNN, predictably dwarfed in the total viewers metric, was also well behind in 18-49s, with 0.67 at 10PM. (See Mitch Metcalf’s special Convention ratings post for much more detail on the numbers.) Meanwhile, a special convention-themed FULL FRONTAL on TBS was at 0.41. The news for fans of USA’s MR ROBOT was depressing: although lead-in SUITS declined just 0.04 from last week’s season premiere to 0.49, MR ROBOT plunged 0.13 to 0.30. Considering its critical and Emmy pedigree, it’s not in any danger, but the result has to be a disappointment to USA. The highest-rated non-news show of the night was OWN’s GREENLEAF, up an impressive 0.12 to 0.64. On Freeform, BABY DADDY ticked down to 0.25, and YOUNG & HUNGRY dropped 0.04 to 0.23. FX’s TYRANT was steady at 0.19. Comedy Central’s ANOTHER PERIOD slipped 0.02 to 0.21. Sundance’s THE A WORD held at 0.02/48K. The unscripted leader was Lifetime’s LITTLE WOMEN pair, with ATLANTA up 0.04 to 0.49, and LA down a tick to 0.46. Bravo’s REAL HOUSEWIVES OF NYC lost 0.04 to 0.45. MTV’s THE CHALLENGE upticked to 0.44, with the post-show down 0.05 to 0.21. On HGTV, HOUSE HUNTERS INTL rose 0.09 to 0.43, HOUSE HUNTERS was at 0.38, and PROPERTY BROTHERS remained at 0.34, with AMERICA’S MOST DESPERATE KITCHENS at 0.24/0.23, compared to last week’s 0.23/0.21. 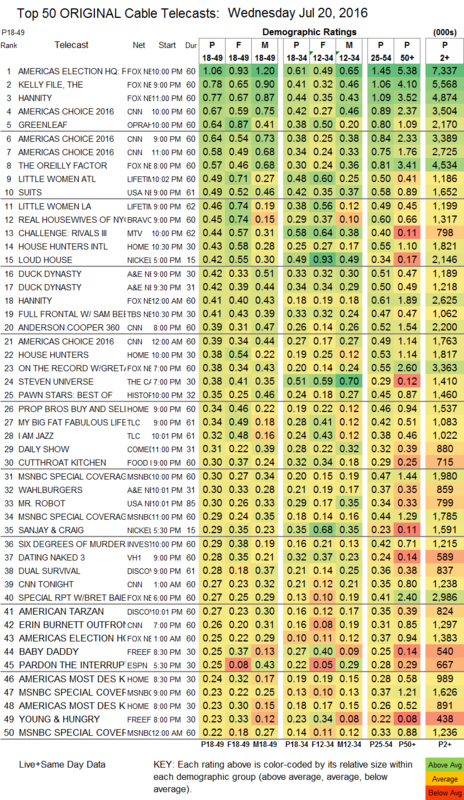 A&E’s DUCK DYNASTY was at 0.42/0.42, compared to last week’s 0.58/0.55, and WAHLBURGERS fell a tenth to 0.30. On TLC, MY BIG FAT FABULOUS LIFE gained 0.04 to 0.34, and I AM JAZZ was up 0.01 to 0.32. 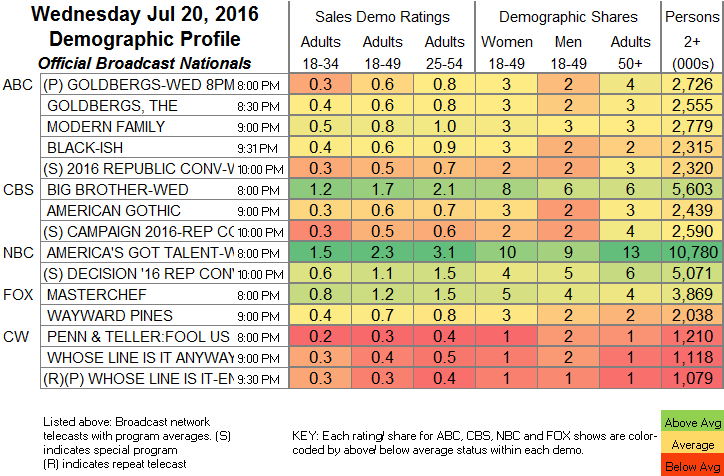 Food Network’s CUTTHROAT KITCHEN gained 0.02 to 0.30. On VH1, DATING NAKED was up 0.07 to 0.28, and BARELY FAMOUS remained at 0.09. Discovery’s DUAL SURVIVAL dropped 0.04 to 0.28, and AMERICAN TARZAN held at 0.27. On El Rey, the first hour of LUCHA UNDERGROUND was up 0.01 to 0.05/127K, while the 2d hour was down 0.01 to 0.01/43K.